— Kenny Rogers, "The Gambler"
I've recently been exposed to the world of resume screening and other hiring processes. I realized that you can have a candidate where you think the on site interview will go great but it doesn't end well and you did a full day of interviewing. 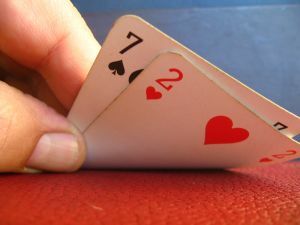 Using a Texas Holdem poker analogy, this is when you fall in love with the cards you are holding, but refuse to believe the bad cards that are being revealed to you in the hopes that the card you want is going to come out in the end. But the problem with this strategy is that if you don't fold your hand, you could bet a lot of money and lose big. In an interview process the thing that you lose the most when you have an unwanted candidate is time. So you really would rather let the candidate go early than let them take up the whole day. Because of this realization I thought it would be fun to try and make several analogies of the hiring process and Hold 'Em and use this as a mantra to help ensure bad candidates get rejected earlier. In Texas Hold Em, you have a few rules of game. You have the cards, some chips to bet, and turns of betting. Each turn another card or cards gets revealed. These new cards can help you make an informed decision about your next move. Sometimes cards you don't want appear. In that case you want to quit playing so that you don't lose too many chips. So, using an interview analogy, the candidate's resume is the card that you hold in hand. This card is used throughout the process by interviewers to double check the candidate. In Hold Em, people like to look at their hand several times during the round. The same thing happens during each step of the interview process by the interviewers when they print out and look at the resume before starting their interview with the candidate. The first round of Hold Em is the initial betting round. At this point, no one knows if their hand will win. The same thing happens in the resume screening process. You have to look at the resume and convince yourself this resume will go through the whole process. 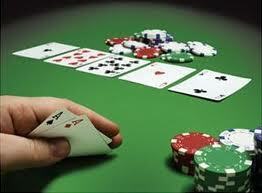 In the betting part of the round you have 3 options (well sometimes 4), pay the initial bet, raise the bet, or fold. When resume screening you can do the same thing. You can fold (reject the resume), pay the initial bet (set aside time to phone screen the candidate), or raise the bet (bring the candidate on site). The 4th option that happens in poker is a reraise, but this doesn't really apply to resume screening. The second round of Hold Em is "the flop". 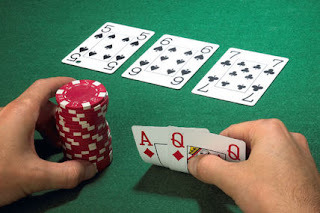 In this phase, enough cards are revealed to make a 5 card poker hand. I am going to venture and say that the hiring flop is when you have your first encounter with the candidate. So assuming you didn't raise, you then set up a phone screen and talk to the candidate. You learn a little about them. Most of the time this is not enough, so you could even throw in a separate quiz to make sure the candidate can code. But even after receiving the quiz, this all adds up as your initial encounter. At this step, you have 3 options again. 'Check' (continue without raising and schedule a half day interview), bet (schedule a full day interview), or fold (reject the candidate). The final two rounds of Hold em reveal one card per round, totaling 5 cards visible. These rounds are "the turn", and finally "the river". The turn is the initial half day of the interview. Whoever you choose to interview the candidate must give you a result. This result is your card. If you don't like the card, you should fold. Don't waste any more time with a bad candidate. Keep in mind the whole time you are betting your time for the candidate. Don't let your candidate know the full format of the interview so that you have the option to fold. Revealing the full schedule to the interview candidate is like having a bad poker face. Some interviews have a runaway train effect that just waste time even though everyone knows the candidate will not pass. The river card is your second half of the day. The candidate made it this far, we didn't reject them, but there is still a chance. The game is over at this point. Its time to reveal your hand. Once you are done with the interviews, you can have an objective conversation about the day, where everyone who interviewed the candidate gives their opinions/reservations. If you reject an interviewee at the halfway mark, its not very constructive to dwell over a bad candidate. Just like in poker, if you fold early, you don't have to reveal your hand to everyone. Finding good people is hard. But don't let bad candidates waste your time.